Mazars Netherlands is part of the Mazars Group, which has 15,000 professionals active in 74 countries. Mazars specialises in accountancy, tax and advisory services. Using its specialized knowledge in these areas, Mazars assists international and domestic companies, public sector organisations, SMEs, entrepreneurs and high net-worth individuals. Mazars wants to inspire and analyse, create and control, innovate and evaluate. With its enterprising approach, Mazars creates value for its clients. Mazars Netherlands wanted to create a client-centric document management system for use by its 600+ professionals working in 10 offices around the Netherlands. The new solution was to be based on SharePoint. It needed to allow Mazars staff to have ‘from anywhere, at any time’ access to the documents related to the customers that they were assisting. It was essential that the new DM system be easy-to-use, and to that end it needed to be tightly integrated with the Microsoft Office applications that Mazars staff use heavily, including Outlook, Word, Excel and PowerPoint. After evaluating a range of alternative offerings Mazars decided to implement MacroView DMF, together with a number of its optional modules. 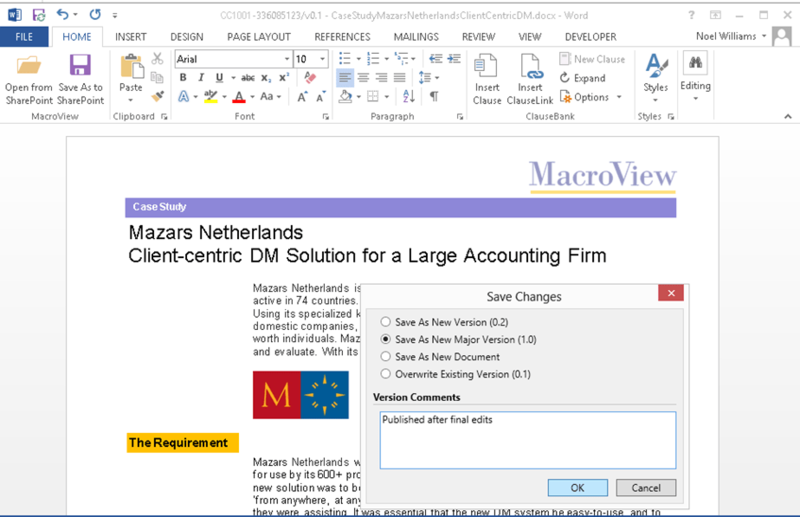 MacroView DMF provided the tight integration with Microsoft Office and the user-friendly experience that Mazars was seeking. The combination of MacroView DMF, MacroView UDN / AOI and MacroView Predictive Email Filing rounded out the functionality of the solution to the point where it fulfilled the expectations of staff who had previous experience with traditional DM systems. The deployment architecture at Mazars consisted of Windows 7, Citrix 7.6 XenApp, Microsoft Office 2013 and Microsoft SharePoint 2013. Solid state drives are used to store the documents, metadata and search indexes. The SharePoint document store has two main areas – Clients and Workspaces. The Clients environment uses a site collection for each Mazars customer. Unique permissions apply to the site collections that relate to customers that are listed entities – this is in order to meet Stock Exchange requirements for protection of information. MacroView DMF is able to expand the full list of Client site collections in a matter of seconds. An integration has been developed between the Clients area of the SharePoint store and the Oracle-based CRM system in use at Mazars. A new Clients site collection is automatically provisioned as a by-product of creating a new client record in the CRM system. The provisioning uses a template so that all Client site collections have a consistent structure, based around six document libraries. This is a fixed structure which cannot be altered for individual client site collections. The Workspaces are site collections which can be used as collaboration areas for a team or project. There is no pre-determined structure for these workspaces, because each team and/or project may have their own requirements. However a template is used to provision the look and feel and some common SharePoint features. Mazars utilize the right-click, Audit command of MacroView DMF, and so have activated SharePoint audit logging. They have created a utility that trims out audit log entries created by the SharePoint search indexer, to prevent blowout in log volumes. Mazars opted NOT to perform a bulk migration of existing documents to the new MacroView + SharePoint solution. Instead staff were shown how they could use MacroView DMF to bulk load documents. This proved to be an effective approach, because it provided employees with an immediate opportunity to work with the new DM tools and to adopt them into their procedures and way of working. After six months of operation more than 500,000 documents were stored in SharePoint. User-friendliness, in particular, good integration with Office applications.